While a dog bark is perfectly natural, a Labrador barking too much is a headache for an owner and a nuisance for neighbors. There are many reasons for a barking dog, such as people passing by a window; barking at other dogs when out on a walk or barking because they have been left alone a barking can quite literally drive you mad. Well, almost. A barking Lab can cause problems with neighbours, other dog owners and even within the family. It is a big problem and one that really needs to be addressed. Fact: There is good Labrador barking and bad barking. At the right time and place it can be positive. Fact: Labrador Barking can drive neighbors and any family member a bit crazy at time. Labrador barking is a fact of canine life. It is a perfectly normal way for a dog to communicate. There are many triggers for barking including when a stranger enters the home, when something is out of the ordinary such as a strange sound or noise. Working dogs will bark as an essential part of herding or for keeping danger away. Barking is even welcome when a dog is acting as a "watch dog" or in cases where there is danger such as a fire. Scientific studies confirm that about 1/3 of owners complain about excessive dog barking and are looking for solutions to the problem. The first step in correcting the issue is to understand why dogs make sounds in the first place. Research has been conducted on the types of dogs that bark more than others. There is no difference between the sexes, but there is a difference between breeds. Terriers, Beagles and herding dogs bark more than others. If you can, training starts as a puppy. After bringing a pup home keep him in a nearby crate, even at night. This way the puppy learns trust and security instead of anxiety. Slowing introduce a range of situations when young, so that they become familiar. This includes exposure to strangers. Dog Bark: Sometimes the cause of excessive barking is the owner. For example, if a dog barks to get attention, if an owner responds, then the behavior is positively reinforced. Working dogs quickly learn that barking is an effective way to herd animals. The bark is commonly used as a warning signal, to let others know that a territory belongs to the dog, when bored, when quickly startled, when alone, due to anxiety or if being teased. Some dogs see barking as part of play. 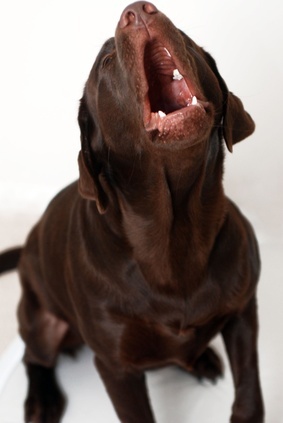 Howling: Howling, unlike normal Labrador barking is usually associated with wolves, a dog howl is also common. Dogs that are outdoors learn that the howl sound can carry long distances as a way of communicating to other dogs. The howl is also used to set the boundary of a territory, to find other dogs, and to let the pack know where to hunt or attack. A howl can also be a warning to other dogs when danger approaches. Whining: Unlike the howl with is for communicating at longer distances, a whine is effective for shorter distances. A whine is a common way two dogs acknowledge the other, show that they are submissive to a pack leader, or if the dog is in pain or feeling frustrated. The whine can also be a request for attention from an owner. Like Labrador barking, if an owner positively responds, then the dog learns that a dog whine is an effective way of getting an owner to respond. The whine is therefore positively rewarded by the owner who is reinforcing the negative behavior. Sometimes this starts as a puppy who finds an owner paying attention with every puppy whine. Dog Grunting: This noise doesn't have many meanings in dogs and is simply a way to acknowledge another dog or to show that a dog is content. Dog Growling: As we know a growling dog is a happy dog. It is often used when a dog senses a threat, to warn off a potential threat, or to show canine dominance in a pack. Along with a dog growl often comes some type of body position or posture which indicates the nature of the growl. An aggressive dog posture is accompanied by a snarl and stare. The dog will remain in place during this behavior. A playful dog may growl along with a tail wag and jumping to show that it is play time. A growl when holding onto a ball or tugging a rope with an owner is just part of the fun. The first requirement for controlling Labrador barking is to have a dog that is relaxed enough to be receptive to training. This is why some Veterinarians recommend a medication or a homeopathic such as PetCalm before training begins. If your dog already obeys commands, then she is a perfect candidate for barking behavior modification. Use positive rewards when a dog does do as you ask. Do not use physical punishment as this will just reinforce feelings of fear and anxiety. Find a special treat for Labrador barking related training such as cooked chicken or a meat snack. Provide some other form of reinforcement such as petting the dog when providing the treat. Eventually, just petting will be reward enough. Never reinforce barking behavior by playing with the dog when she is barking. This just communicates that making noise is an acceptable behavior. It goes without saying that a puppy should never be encouraged to bark at people or other animals. Behavior training sessions should never be longer than 5 to 10 minutes. There is also no reason why you can't hire a dog trainer to assist. As mentioned above, Labrador barking or any dog bark can signal many types of behavior. Correcting or stopping barking means that the owner has to first understand the trigger for the bark, and then either eliminate or modify the behavior based on this understanding. This falls under the acceptable types of dog barks. They are often encouraged, particularly if a dog thinks that a family member is in danger or if a stranger is acting suspiciously. These lower pitch barks tend to pick up in volume and frequency as a stranger approaches. Note if the dog is using a combination of barks and growls, as this is a more aggressive posture. Try to understand if the behavior is due to being aggressive or if the dog is actually afraid. Where this behavior is not acceptable is if a dog barks at the mailman, joggers, children passing by and others. The problem is that since these people pass by, the dog actually thinks that the barking caused the person to move out of his territory. One approach is to keep a dog away from the window. This way they don't see the mailman and the Labrador barking issue goes away. If this isn't easy, then the key is to make sure that the dog isn't rewarded for barking. The key is sometimes to let the dog that a quick dog bark or two is "enough." That extended or excessive vocalization is not needed. Sometimes allowing one or two barks and then say "enough" might change the behavior. Another dog bark training tip is to teach have someone knock on the door. After two barks, stop knocking and have someone else distract the dog in order to divert attention to something else. If she stops, say "enough" and provide praise and a treat. If the puppy does not stop put a treat in front of her nose. When she stops for a second, say "enough" and wait a few seconds. If she is quiet, then provide the treat. The goal is to have the puppy associate the word "enough" with the behavior to stop barking. If a dog is afraid, such as fear of a new visitor, then a different approach is required. The goal here is to each your dog to stay relaxed when a stranger approaches. The dog should look to you for how to behave. Start by have someone approach you and the dog from far away. Provide treats as the dog stays relaxed. Slowly over time have someone approach a drop closer, to the point where the dog doesn't stay relaxed. When people get really close, have them throw treats to the dog, so treats are associated with people. Do this in open areas away from others not involved in the training to avoid distractions or confusion. Some Labrador barking is to get attention. This is often the case where a dog associates a bark with getting attention. Often this behavior is taught when the dog is young To undue this type of behavior, simply ignore the dog until he or she learns that barking doesn't equal play time, treats or a pat on the head. Even if you say "enough" to the Labrador dog barking, it is still a form of attention, which reinforces the behavior. Here, barking can be controlled by correcting the behavior. Create a startling noise when a dog starts to bark such as shaking coins in a can or a horn. This will startle the dog and being to associate barking with an unfamiliar and uncomfortable sound. At this point provide s substitute for barking such as a Kong Toy. Other forms of reward can be a walk or play time. If a dog wants to play, expect barks that are short. A dog will sometimes break out into a bark when it gets over excited, particularly when playing a game. The key to stopping this dog bark is to stop play for a little while. Dogs use barking to identify themselves in a pack, particularly over short distances. If a dog hears a neighbor's dog, then they will feel compelled to respond. Some Labrador barking is to self entertain themselves when bored. After all, would you like to lay around the house all day? The best approach for this kind of barking is to try and increase the number of walks or exercise sessions. You could also buy a Kong toy which keeps dogs entertained via a hidden treat that they have to figure out how to get. Keep this toy out of reach and bring it out once a day for entertainment. 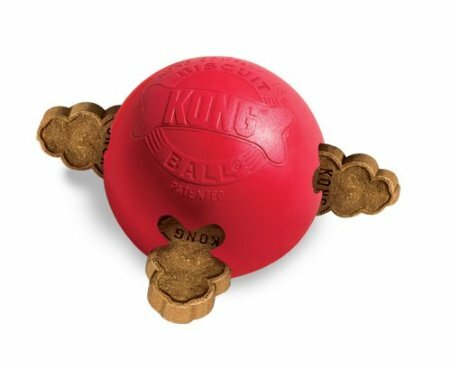 A Kong Ball Uses Hidden Treats to Keep a Dog Occupied. If boredom barking is an issue, an engaging toy could help. These toys can also be used to distract a barking dog, such as when a stranger visits the home. A dog barks in order to make his presence known with other dogs in the neighborhood. Some dogs do this by instinct. If there are multiple dogs, usually one starts and others follow. The approach to this type of barking is to provide a distraction whenever it starts such as a Kong Toy as shown above. A dog that is anxious when someone or another dog leaves may bark. For example, in one case a dog would only bark when a companion left the home first. The solution was to have the problem dog out of the room whenever the other dog was taken for a walk. Once the trigger was removed, the problem stopped. In other casts a dog feels anxiety when a member of the family leaves. As the person moves away from the home, the dog becomes more anxious. One approach is to distract the dog when someone leaves with a Kong Toy as shown above. Another approach is to teach the dog that the person leaving will return by leaving a comforting signal. There are also homeopathic or natural products such as PetCalm which may help anxious dogs. Another approach is to teach the dog how to relax in these situations. For example, act like you are about to go out of the house, but don't leave. This can be a simple act such as dropping keys into a tray or ringing a bell. Gradually do the same, but leave the house, but come right back in a minute. Start to extend the time a little bit each day. Another tip is to vary the routine when leaving. If you put on shoes then grab keys, do the reverse some days. If a dog can't pick up on the clues, they may not become anxious. Some days, don't leave at all, but stay in the home. Some dogs respond well to continuity in the home when a person leaves. For example, play music while in the home, and keep the music on when you leave. This will feel more familiar to the dog. If the anxiety is due to something outside the house, then keep the shades closed. Providing a walk before you leave will also keep the dog from getting bored. If a dog is destructive, get a hidden video camera and tape your dog when you leave. You might discover that the dog get anxious and starts to destroy household items only right before you usually come home. Don't punish a dog that has this behavior. As an alternative, say "hello" and then go about your tasks. The goal is to associate you coming home with something pleasant such as together time. Medications can also be prescribed to calm a dog or owners can try a homeopathic such as PetCalm if a dog is unable to keep control. This happens when a dog responds to a situation that is unfamiliar or sudden. These are hard to avoid unless you can remove identified triggers. If a dog barks when started, then a verbal command such as "enough" combined with behavior modification. If you know the sound that is the trigger, record it and play it back for the dog at a soft level. Find the level where the dog stays relaxed. Slowly increase the volume until the sound is no longer startling. If your dog suffers from this type of issue, then it is best to work with a veterinarian for medications, and a professional trainer. Dog bark collars use a scent, air, static shock or vibration that occurs whenever a dog starts to bark. 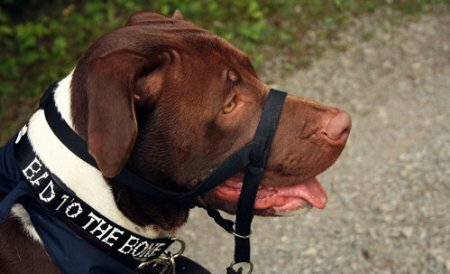 The collars are often used with behavior modification techniques described above. Some collars have varying degrees of air or shock, making it easier to find the unpleasant level. The problem with these products is that they use a negative reward to change behavior instead of something positive. The other problem is that you may not be around to provide a positive reward such as a treat after the barking stops. A Citronella Dog Bark Collar uses a burst of air and scent every time the dog barks. This could be a quick fix to a Labrador barking problem. The advantage of a dog bark collar is that it will work even when you are not at home. 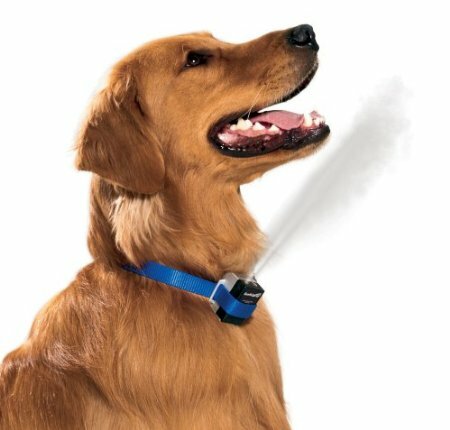 Another advantage to a collar that uses air or a citronella burst is that the training cycle may go faster. Dogs that respond well result in an easy solution to the "how to stop dog barking" problem. We would not recommend a dog shock collar since this type of negative reward is un-necessary. We prefer trying the Cintronella approach first. A dog head collar such as this one from Halti, works by providing a gentle tightening around the muzzle when a dog barks. Use this type of collar in conjunction with a verbal command such as "enough." After the Labrador barking stops provide a positive reward such as affection and/or a treat reward. Do you have a dog barking, training or behavior question for our Vet? If you do we'll answer it for free. Just fill out the form below and ask.